Located in Avanos, Suhan Cappadocia Hotel & Spa is on the waterfront, a 4-minute drive from Alaaddin Turkish Bath and 6 minutes from The Hair Museum of Avanos. 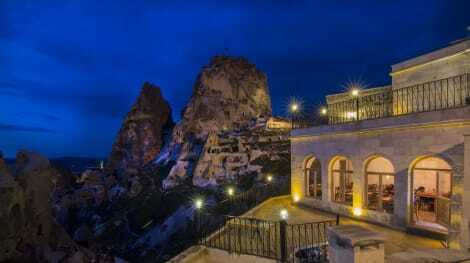 This spa hotel is 8.5 mi (13.8 km) from Uchisar Castle and 2.6 mi (4.2 km) from Pasabag. With a stay at Goreme Kaya Hotel - Special Class in Nevsehir, you'll be in the historical district, within a 15-minute drive of Uchisar Castle and Roman Castle. 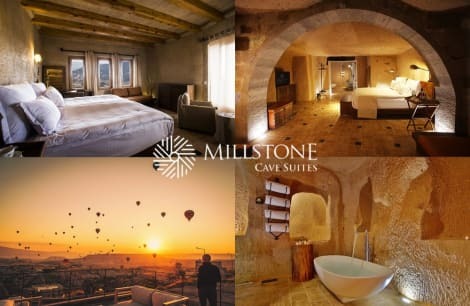 This 4-star hotel is 0.4 mi (0.7 km) from Göreme Roman Castle and 0.7 mi (1.1 km) from Aydın Kırağı. Located in Urgup, Yunak Evleri - Special Class is a 2-minute drive from Asmali Konak and 9 minutes from Sunset Point. 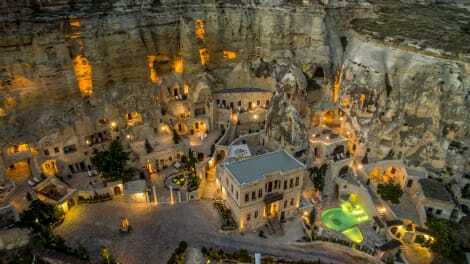 This hotel is 3.9 mi (6.3 km) from Goreme Open Air Museum and 4.3 mi (7 km) from Rose Valley. Make yourself at home in one of the 43 guestrooms featuring minibars and LED televisions. Complimentary wireless Internet access keeps you connected, and digital programming is available for your entertainment. Bathrooms have rainfall showerheads and complimentary toiletries. Conveniences include laptop-compatible safes and separate sitting areas, as well as phones with free local calls. Grab a bite to eat at the hotel's restaurant, where you can enjoy drinks at the bar and dine alfresco. Or stay in and take advantage of the room service (during limited hours). A complimentary full breakfast is included. Make yourself at home in one of the 141 air-conditioned rooms featuring minibars. Complimentary wireless Internet access keeps you connected, and satellite programming is available for your entertainment. Private bathrooms with shower/tub combinations feature jetted bathtubs and complimentary toiletries. Conveniences include safes and desks, and housekeeping is provided daily. Adnan Menderes Bulv Otel Cad. Make yourself at home in one of the 126 air-conditioned rooms featuring minibars and flat-screen televisions. Rooms have private balconies. Complimentary wireless Internet access keeps you connected, and satellite programming is available for your entertainment. Private bathrooms with bathtubs or showers feature complimentary toiletries and hair dryers. Take in the views from a terrace and a garden and make use of amenities such as complimentary wireless Internet access. This hotel also features concierge services and a television in a common area. Getting to nearby attractions is a breeze with the area shuttle (surcharge). lastminute.com has a fantastic range of hotels in Nevsehir, with everything from cheap hotels to luxurious five star accommodation available. We like to live up to our last minute name so remember you can book any one of our excellent Nevsehir hotels up until midnight and stay the same night.